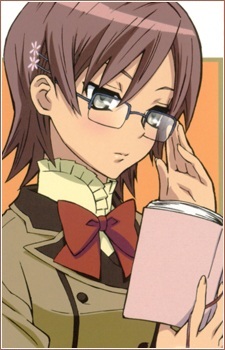 Kiri is an aloof and bespectacled student at Ame no Kisaki. Although she appears quite cold and dispassionate on the surface, she is actually a very caring and helpful personality. At the bequest of the teacher, she helps Kanako to overcome her initial troubles at the school, to the extent that she is willing to put her own reputation at stake by pretending to be Kanako's lover; so as to avoid trouble from Ryūken's fans. She eventually becomes very close friends with Sachi.